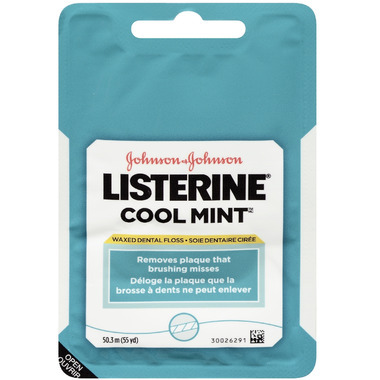 Remove that pesky plaque left behind after brushing with a waxed string floss that slides easily between teeth, with the iconic flavour of LISTERINE® COOL MINT™. This is my favourite floss. Itâ€™s just the right thickness for the spaces between my teeth. This is absolutely my favourite floss! Most importantly because its green colour makes it really easy to see how much plaque has been removed--why isn't more floss coloured for this reason? As well, it glides very easily between the teeth (and mine are crowded in places, and have some rough spots, but this floss never breaks!) One other thing--it is not so thin that it cuts into gums if it's pulled down to them, so it really is the ideal thickness...just a great product all around! Only one complaint: I have had to order it online, because I can never find it in my local pharmacies! Distribution must be very ineffective, which is a shame for such a great product!